Today, heaven gained the most precious, beautiful angel. With broken hearts, we said goodbye to our GiGi this afternoon. Her tired body simply couldn't match the Herculean strength of her mighty spirit. After beating the odds numerous times, she's now at peace. She no longer has to fight and is free from pain and disease; frisking with her goofy gallop over the rainbow bridge to join her angel sisters, Simone and Gretel-Ann. We adopted GiGi in February of 2012. 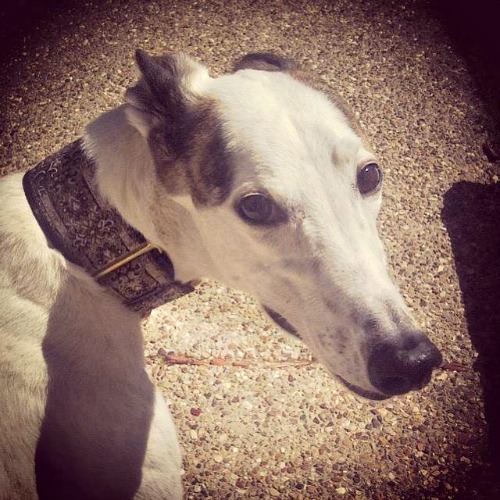 She had been surrendered to a vet clinic in Waco riddled with heartworms and was taken in by Greyhound Adoption League of Texas, Inc. We adopted her the moment she completed treatment and was given the 'all-clear'. It was love at first sight for the entire family - we knew immediately she was MEANT to be ours. Only a week after we adopted her, GiGi was diagnosed with stage 4 cutaneous lymphoma and given a prognosis of 1-8 months to live - TOPS. She was a pillar of strength while undergoing 6 months of chemo, at which point she was found to be in clinical remission. GiGi lived a full, joyful, happy life in remission from the disease for over 2 1/2 years - a miraculous feat for a hound with such an aggressive, advanced, terminal cancer. This September, we noticed swelling in her abdomen and feared the worst - the return of the cancer. After a battery of tests and procedures, it was determined that GiGi was in a state of advanced liver failure, and she was given 2-6 weeks to live. We did all we could to treat her symptomatically, and she once again fought hard to beat the odds, enjoying nearly 3 months of symptom-free, happy, quality life with our family. Sadly, the monster returned with a vengeance over the last few days as the disease ravaged her frail body, and GiGi let us know it was time. She crossed the bridge surrounded by her loving family and enfolded in our love. GiGi was the strongest, bravest, sweetest soul I've ever encountered. Her precious spirit has already left a void in my house and in my heart that will never be filled. Rest in peace, my sweet girl.